What are the elements that make Zelda what it is? Well, Link’s trademark tools, for one. The classic puzzles, from block-pushing to switch-flipping. The land of Hyrule, with its unique history, religion, and cultures, is another integral part of the Zelda series. And of course, the series would not be what it is without the characters themselves, from the menacing Ganondorf to the noble Link. However, when people think of the elements that define the series, there is one they often forget: music. The series’ music is almost all composed by Koji Kondo. Koji Kondo is a man devoted to his work, and quite possibly the most famous composer of video game music. While there are many series contending for the role of “best video game music,” The Legend of Zelda’s music is definitely some of the most iconic. Start humming the original Overworld theme, and most anyone would be able to say “Hey, that’s Zelda, isn’t it?” Perhaps the only video game tune more well-known is the World 1-1 from Super Mario Bros. (another one of Kondo’s works). Kondo was so determined to create the best possible music for Nintendo that Nintendo’s developers worked with him to tap into another sound channel, one usually used for sound effects (Biography, Par. 2), allowing for fuller use of the NES’s sound capabilities. While the series’ music has always been good, it gained actual plot importance in Link’s Awakening. The titular “awakening” required a song, and all the talismans in the dungeons were the instruments required to play said song properly. 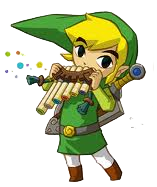 The climax of the game was Link using these instruments to play the Ballad of the Windfish. The song still remains one of the most beloved songs in the entire series. But even with music playing a greater role, it wasn’t until Majora’s Mask that the series perfected the art of storytelling through music. When you’re dropped into Clock Town early in the game, the music suggests a bustling but otherwise cheerful city. However, as time passes, the formerly cheerful melody grows more frenzied and despairing. The Song of Healing, while more of a mood-setting piece than a storytelling one, fits the situations where it’s used so perfectly. Its melancholy but hopeful tune symbolizes the letting go and moving on that the in-game listeners find they have to do. Nintendo then moved on to telling much more subtle stories with music—in The Wind Waker, the music on Windfall Island and the Forest Haven match up very well with Ocarina of Time’s Kakariko Village and Kokiri Forest respectfully, hinting early on that the locations may be connected. In addition, in The Minish Cap, Zelda’s leitmotif (fancy word referring to a recurring musical theme) is not Zelda’s Lullaby, but the ending credits from The Adventure of Link. Is this simply a musical reference, or does it hint at the game’s placement in the timeline? Finally, in Twilight Princess, Nintendo showed just how much storytelling could be done with a single song. A good majority of Twilight Princess’s are simply remixes of the game’s Hyrule Field theme. For example, Hidden Village and Resurging of Kakariko Village draw bits and pieces from it, and Calm and Hope, Gerudo Desert, and Midna’s Lament are all nearly exact arrangements of the theme, all tweaked to allow them to evoke the intended feeling. Despite the songs having similar or identical melodies, they provide very different moods. Of course, the games have a sort of indirect storytelling to them as well. Many of the games use thematic instruments or sounds. 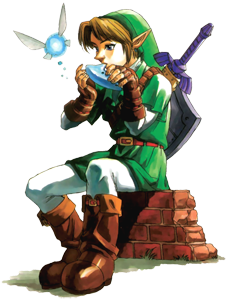 For example, the ocarina featured prominently in the soundtracks for Ocarina of Time and Majora’s Mask (as well as the harp, Sheik’s instrument of choice, in OoT). The Wind Waker used primarily a wind ensemble to evoke the feeling of adventure on the high seas, while the more dramatic and somber Twilight Princess more of a full orchestral feel. Spirit Tracks’ music managed to take it a step further, with pan flute-centered music and rhythm reminiscent of the puffing and chugging of trains. In addition to these thematic sounds, there are recurring bits and pieces of music that can nod towards other games. Outset Island from The Wind Waker has elements of Ocarina of Time’s Kokiri Forest…fitting, as they’re both starting villages. Aryll’s theme contains traces of Zelda’s Lullaby, possibly indicating that it is she, rather than Zelda, who is the driving force behind your adventures. When any version of the Hyrule Castle theme shows up, you know that nothing good is about to happen. Ilia, a ranch girl who loves horses, has a theme oddly similar to that of an earlier Zelda rancher, indicating that Ilia is, indeed, the game’s take on Malon. The Stallord Battle in Twilight Princess used a tune nearly identical to the Dinosaur Boss Battle theme from Ocarina of Time, since the battles had a similar feel. Finally, while there are games where the original Overworld theme does not appear, each game’s take on the overworld has quite a few similarities to its predecessor. But other games can do these things. Other games have done these things. So why is music such a big part of Zelda compared to other games? Well, there’s one big reason: very few games place such emphasis on in-game music. Music in the Zelda series has, in game, almost been a form of magic. In the original game, a flute transported you around to the dungeons. In Oracle of Ages, a harp was what allowed you to pass back and forth in time. In Ocarina of Time and Majora’s Mask, the titular ocarina did everything from opening paths to healing souls. Majora’s Mask specifically used musical instruments to show the differences between Hyrule’s cultures: the Deku play pipes, the Gorons prefer drums, and the Zora had a full-out modern-looking rock band. In The Minish Cap, Ezlo even shrinks you down to size by singing. 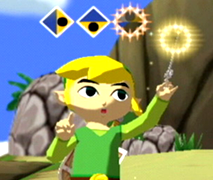 Every game, with the exception of Phantom Hourglass, has included a musical instrument (or in the case of The Wind Waker, a conductor’s baton), and that instrument is always necessary to advance further in the game. In six games (Link’s Awakening, Ocarina of Time, Majora’s Mask, Oracle of Ages, The Wind Waker, Spirit Tracks), a musical instrument had major plot importance. Two of the games (Ocarina of Time, The Wind Waker) are named after the titular instrument. Noticeably, however, while all these instruments are clearly magical, using them never drains your magic meter (in games that have one, at least). Could it be that in the Zelda universe, music is inherently magical? As the games have progressed, the in-game music has become more and more interactive. While players originally just pressed a button to play the instrument, Ocarina of Time and Majora’s Mask had the players enter a sequence of buttons. In the Wind Waker and Twilight Princess, the musical sections (conducting and howling, respectively) required specific timing. In Spirit Tracks, since you used both the microphone and the touch pad, it was almost as if you were playing the Spirit Flute yourself. Every in-game instrument has had a unique function and feel, making creative use of each system’s capabilities. As a result, the idea of a musical instrument has become something comforting and familiar instead of just stale. With Skyward Sword being the first game in the series designed with motion controls in mind, there are almost endless possibilities. While returning to a conductor’s baton might seem too much like a rehash, there are still plenty of unique ways the controllers can be used. Use the Wiimote and nunchuck like a trombone! Use them as mallets for some form of percussive instrument! Even draw one controller across the other like a violin! In conclusion, I think it’s fairly safe to say that since music plays a large part in both the Zelda games and universe, it may be the most defining element of the series. I don’t know what they have planned for Skyward Sword, but I’m almost 100% certain that it will feature a musical tool of some sort. In fact, I think I’m going to go out on a limb and say that Zelda has the most important music in regards to the game itself. After all, Final Fantasy, Sonic, and Mario may have great music, but it’s only in Zelda that you can use it to call your horse, open doors, and transport you halfway across the world.